$90.00 In stock. Order in the next 19 hours, 51 minutes and it will go out today! A professional confetti cannon that gives you a confetti explosion anytime you need it. 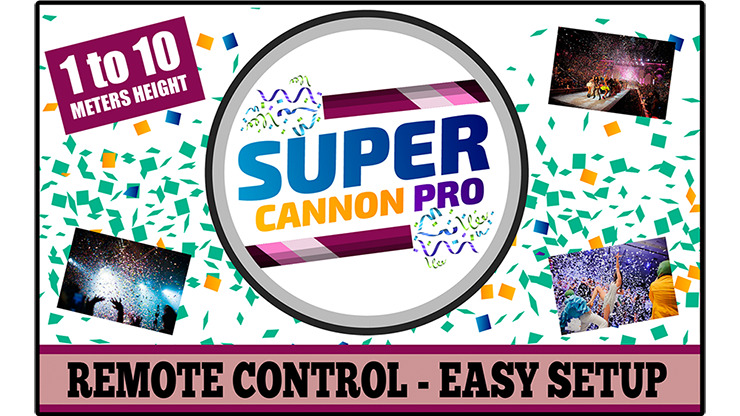 SUPER CANNON PRO can throw confetti from 1 meter to 10 meters high. You are able to use it in either houses or on big stages. Now, you just need to get one and put it to work. A remote control gives you total control in one button. It is easy and secure to handle. SUPER CANNON PRO uses flash cotton to ignite. Forget about powder or compressed air. Forget the past. Welcome to the future and get the great ending that your show deserves with SUPER CANNON PRO!